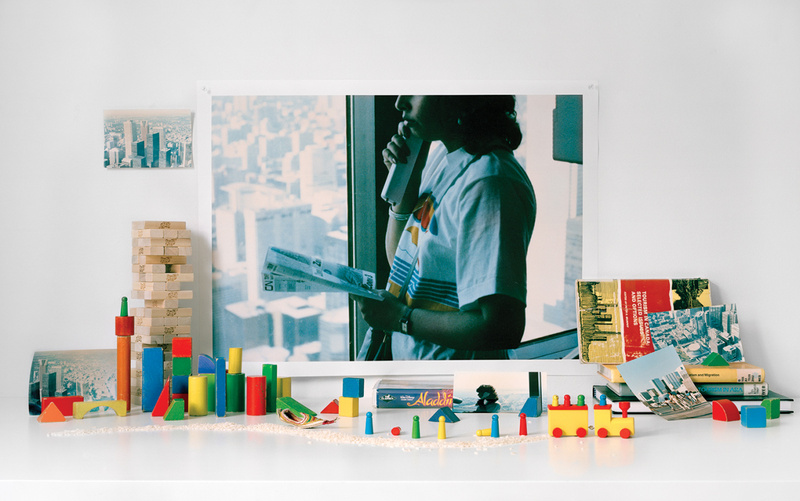 Zinnia Naqvi, A Whole New World – CN Tower, 1988, 2019. Courtesy of the artist. Zinnia Naqvi, Keep Off the Grass - Cullen Gardens and Miniature Village, 1988, 2019. Courtesy of the artist. 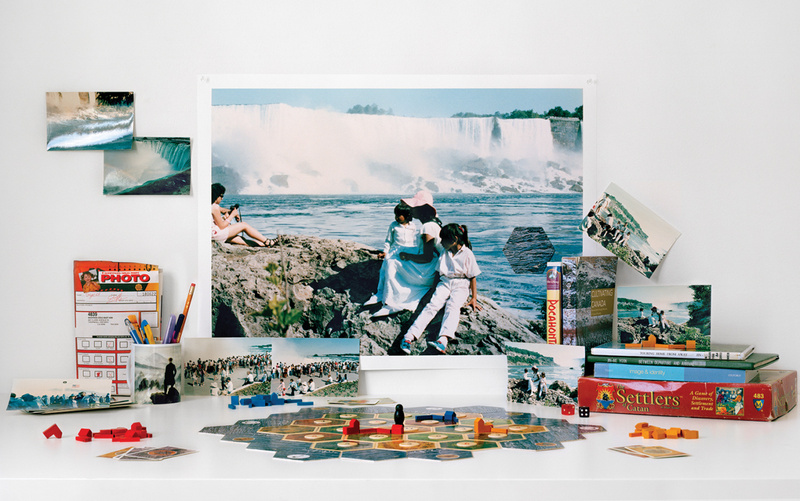 Zinnia Naqvi, The Wanderers - Niagara Falls, 1988, 2019. Courtesy of the artist. Yours to Discover is a new site-specific installation outside the Peel Art Gallery Museum and Archives (PAMA). Based in Toronto and Montreal, Zinnia Naqvi has created a large-scale photographic triptych for the façade of the building—a modernist structure linked to a former 19th-century courthouse. Each image features photographs of Naqvi’s family visiting various tourist attractions, combined with collections of personal ephemera. Drawing inspiration from the multi-generational programming space located beneath, the artist considered how the local community might see these images and be reminded of their own family excursions. The incorporation of popular board games and toys gives the images a playful, dynamic appearance; only at a closer reading of the work do its more critical and political aspects become evident. Taken during the late 1980s around the time Naqvi’s family immigrated to Canada from Pakistan, her personal photographs are set at such popular Ontario attractions as Niagara Falls, the CN Tower, and Cullen Gardens & Miniature Village. Some of the objects surrounding the images speak to stereotypical depictions of other cultures—such as Disney’s Aladdin and Pocahontas. Books pertaining to the immigrant experience are also subtly integrated into the compositions, with titles such as The New Pakistani Middle Class and Touring Home From Away visible upon closer inspection. Assembled and photographed by the artist in her studio, these contemporary tableaux vivants (living pictures) address common newcomer experiences and identities. Naqvi’s images reflect a shared reality for many people living in Brampton, where more than half of its residents are new immigrants, and visible minorities account for the majority of its population, particularly those of South Asian descent. Traditionally, the tableau vivant incorporated costumed actors strategically placed within a carefully lit, prop-filled scene, which was then painted or photographed to narrate a specific event, action, or idea. In this series Naqvi takes the concept of living pictures to another level of discourse and critical engagement. The Naqvi family’s photographs insert the Pakistani body within these tourist environments, creating a backdrop that challenges traditional pictorial representation. Issues related to consumerism, development, personal agency, and colonial cultural stereotypes are each subtly, yet tactically, embedded into Naqvi’s images.